While funding for real estate startups is still at a strong pace, it is clear that there is caution in the wind. It’s increasingly harder for new and early stage startups to secure funding than it has been in the past few years. CB Insights just put out a fantastic analysis of the current state of the real estate tech market and while funding is still robust, the underlying trend is that fewer, but much larger deals are getting done. Interestingly, the funding is now coming from very significant sources such as VC’s, incubators, well funded developers/owners as well as the large brokerage firms. 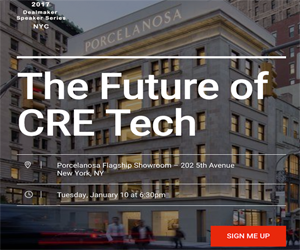 Of course there are many Angels and real estate owners/brokerage firms that remain active in real estate funding, but the above firms are clearly stepping up their investment game in CRE tech. Don't forget to register for CRE // Tech San Francisco on June 8th! Tickets are on sale now! Newer PostWhat does “Psychogeography” have to do with lead engagement for real estate?